Before you begin the process of planting pumpkins, you need to decide how you want to use the pumpkins. This will dictate when you plant them. Pumpkins usually are ready for harvest 80-120 days after planting, depending on the variety. In general, the larger the pumpkin produced, the more days required between planting and harvest. Consult the seed packet to determine the time required between planting and harvest for the particular pumpkin variety you want to plant. Allow an extra 7-14 days for the seeds to germinate and another 10 days for the pumpkins to cure after you harvest them. So, for example, if you wanted your pumpkins ready to use by October 1st and the variety you choose takes 90 days to mature, you would start counting backwards; 10 days of cure time would take you to September 20th. Then 90 days of growing time would put you at June 20th. Then 14 days of germination time would mean you would need to plant the pumpkins in the first week of June. Keep in mind that you should wait at least until air temperatures consistently reach 70 degrees F during the day before planting pumpkin seeds. 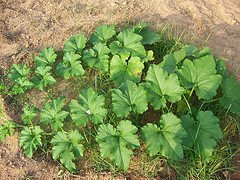 Pumpkins should be planted at least 6-8 feet apart from each other and other plants in the garden. Their vines will run a good ways. The vines will root themselves into the ground, which is needed to gather as much food as possible. This will help the plant produce lots of high quality fruit. The seeds are sowed directly in the garden, usually in mounds or hills that you create. They need to be planted in an area that drains well and gets at least 6-8 hours of direct sunlight per day. 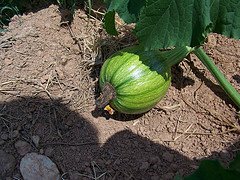 Once you have determined where you want to plant pumpkins, make sure that the soil has been well tilled down to a depth of at least 8 inches. Using a hoe, rake or shovel, create a small mound or hill out of loose dirt. The mound needs to be 8-12 inches high and 3-4 feet across. 4-5 seeds should be planted 6-8 inches apart around the middle of the mound. Use your finger or the handle end of a hoe or trowel and create holes an inch deep. Drop the seeds in and cover them with an inch of fine soil. After planting pumpkin seeds, be sure to water them in well. The seeds will sprout in 10-14 days. The plants need to be thinned 2 weeks after they sprout to maximize fruit production and plant viability. Selectively remove all but the two healthiest seedlings per mound. Now you're done planting pumpkins and can watch them grow more and more each day. But before the plants get too big, you need to start thinking about caring for them to get the maximum quality and quantity out of your pumpkin patch. Click on the following links to learn about watering, fertilizing and harvesting your pumpkins.